Increasingly, advocates of space exploration believe leaving the planet is the natural next step of human evolution. They hope this will lead to a shift in human consciousness from an earth-centered frame of reference to one centered on the solar system and, eventually, the entire galaxy. In the video below, world-renowned physicist Freeman Dyson's son, George Dyson, tells the spellbinding story of Project Orion, a massive, nuclear-powered spacecraft the size of the Empire State building fueled by atomic bombs with the power to destroy half of Planet Earth. The mission was to take us to Saturn in five years. With an insider's perspective and a cache of documents — many still classified — photos and film, Dyson brings this dusty Atomic Age dream of the early 1960's to life in the video below. Today, the project lives today in limbo at NASA possibly to be activated should an asteroid arrive with our name on it. Meanwhile, in Great Britain today, Richard Obousy plans to build a starship that might harness the awesome power of nuclear fusion to travel to interstellar destinations. Obousy, the Primary Propulsion Design Lead for Project Icarus, holds a Ph.D in theoretical physics with a focus on Casimir energy, dark energy and the stability of higher dimensions. He is known for his interest in the Casimir Effect and has explored the possibility that dark energy could be an artifact of Casimir energy in extra dimensions. Project Icarus, launched in 2009, is an ambitious five-year study into launching an unmanned spacecraft to an interstellar destination. Headed by the Tau Zero Foundation and British Interplanetary Society, a non-profit group of scientists dedicated to interstellar spaceflight, Icarus is working to develop a spacecraft that can travel to a nearby star, with the goal of reaching its stellar destination within a century. Based on the distance to the closest star, it appears that we need to accelerate to approximately 5 percent the speed of light to reach this objective. In an interview with Discovery, Obousy said that the "pioneering rocket scientist, Konstantin Tsiolkovsky, developed an equation that predicts how much rocket fuel one would need to reach a given top speed. For chemical rockets, the type that are used today, this equation predicts that to reach 5 percent the speed of light, one would need more chemical rocket fuel than there is matter in the known universe!" "Two popular technologies that may be able to accomplish this," he continued, "have been explored in some detail. The first are solar sails, which are massive sail-like structures extended in space over many kilometers, which capture the momentum of photons emitted from our own sun to generate acceleration. The second is fusion energy, a form of energy which is known to power our sun, and, as far as we know, all the other stars in the universe. "Fusion typically involves light elements (for example, Hydrogen) being raised to incredibly high temperatures," he explained, "typically many millions of degrees. When these light nuclei collide, they are able to form new heavier elements and release vast amounts of energy in the process. "To date, our technology has not been able to reach what's known as 'break-even' fusion, where more energy is output from the fusion reactor than was put in to start the reaction. However, there are numerous high profile, and quite a few low profile, fusion research groups across the world focusing a large amount of time and resources into making this a reality. Many believe it is just a matter of a few short decades, perhaps less, until this is done. "What makes fusion particularly appealing' for propulsion," Obousy concluded, "is the amount of energy that it releases when compared to chemical rocket fuel. A good rule of thumb is that, pound for pound, fusion releases about a million times more energy. Because of this, it is ideally suited for interstellar propulsion. 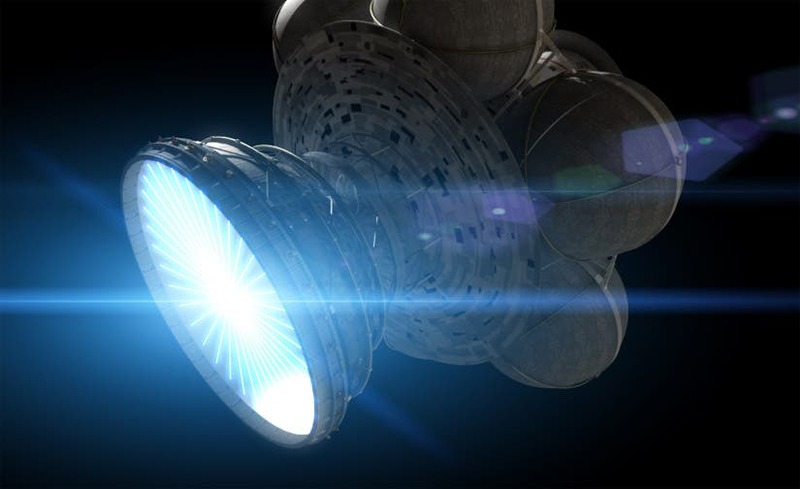 One of the many challenges in actually building a fusion starship would be the creation of energies high enough to ignite the fusion reactions which could then be used to propel the spacecraft. Image top of page: The Daedalus interstellar vehicle is designed to be propelled by igniting a series of fusion fuel pellets, 'not vastly different from a conventional internal combustion engine, where small droplets of gasoline are injected into a combustion chamber and ignited.' Courtesy of Adrian Mann.